I'm all about the Benjamins...saving them that is! So when I whipped up a pretty little craft for my home in a matter of minutes and for a bargain price, it occurred to me that this would be a beautiful addition to any wedding aisle arrangement and decor. In a matter of 10 knots I had a lovely little hanging planter or votive holder. Find a mini shepherd's hook and you're all set! Check out this awesome tutorial which can help you determine all your measurements and show you a step-by-step process on how to create this pretty aisle arrangement. 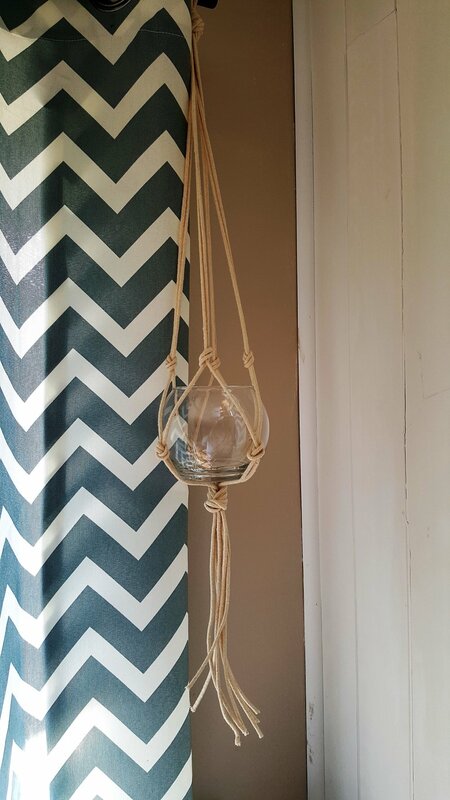 You can gussy this baby up with a few more complex knots, different colored macrame cord, or even choosing a colored ball jar for your vase. So many options for a beautiful outcome! Happy DIYing!